While Kyn isn’t perfect and suffers from some bland characters and a story that fails to captivate, it is still an impressive offering considering that it is the work of mostly two developers. It features plenty of strategic, but action-packed combat, a wealth of equipment to craft and plenty of well-designed maps. Fans of older party-based games, like Icewind Dale will feel right at home with Kyn. Gameplay: Kyn offers a single player, party based combat experience with plenty of action. Graphics: Varied levels and plenty of detail. After undergoing a ritual to gain the power of Magni warriors, Bram and Alrik emerge to find that their world is not quite as peaceful as they left it. Their newfound powers make them the ideal candidates to find out why the once peaceful race of Aeshir not only changed color, but started attacking humans. The story unfolds across 18 quests that take the Magni warriors, and the companions that join them along the way, on an epic journey. Kyn is a role playing strategy game that features a healthy dose of Norse mythology when it comes to its world and characters. The game is party based, so in addition to the two main characters up to four other members can join in. Since controlling six characters during real-time combat can be a little tricky the game also features a “slow motion” button that brings the action to a crawl giving you time to work on your tactics. Most enemies can be disposed using a combination of brawn and magic, but some require a bit more strategy, such as the armored foes who you have to flank in order to hit their weak spots. Although the game delights in throwing hordes of enemies at you there is more to it than just combat. Later levels also introduce some puzzles along with the trials for a more cerebral challenge. In total there are eighteen missions, each of which takes place in a different location. However, Kyn is not an open-world title, so all quest areas are accessed in linear fashion from the town of Vinborg that serves as a central hub. Between missions you can buy and sell equipment or make use of the crafting materials you looted to forge new items. There is a ton of things to craft and, best of all you don’t need any money or blueprints, only the necessary materials. You also get to spend your attribute points, which interestingly enough are earned not through gaining experience, but by completing quests. Attribute points can also only be allocated to mind, body or control, which basically determines whether your character is a warrior, archer or mage. There is no fear of picking wrong either as Kyn generously allows you to reassign stats at any time outside of combat, so you can pretty much change the classes of your character as needed. The story starts out a little slow, but does become more interesting as the game progresses and your characters uncover new information about the true threat facing their world. Having said that, the story does suffer from not being very engaging and the fact that your party members are pretty bland just makes matters worse. There are a couple of humorous conversations during the course of the game, but overall there is very little dialogue that stands out as memorable. Visually Kyn leans more towards a cartoonish look instead of realism, but the gameworld is very vibrant. Each area is packed with plenty of detail and the overall art direction is very good. The enemies you face initially are a little generic as they consist mostly of wolves, skeletons and goblins, but you do start to encounter some more exotic foes later on. The game is viewed from an isometric overhead perspective, but you can only view in or out and pan around the map. Not being able to rotate the map at all feels a bit restrictive at first, but it is something you get used to. (Note: The developers listened to fan feedback and implemented camera rotation as an option!) Most of the maps are large enough that you can explore a bit to find extra loot chests, but there is never any danger of getting lost or not knowing where to go. The game doesn’t feature any voice acting, which is understandable given the small team and budget, but the soundtrack is absolutely great. It features a remarkable musical score with plenty of memorable tunes that definitely enhances the mood of the game. Despite having to babysit such a large party, the controls work pretty well for the most part. Maneuvering everyone around is as easy as dragging a selection box around them and right clicking to walk or attack. Characters have access to spells and abilities as well, which is easily accessible while slowing down time. Path finding is still a little iffy at times and we encountered a few instances where characters would sometimes get stuck behind objects and end up left behind. Although the game isn’t afraid to challenge players it has five difficulty settings that can be adjusted on the fly, so it is pretty accessible. Overall, Kyn is a remarkable achievement for only two developers working on a shoestring budget and definitely feels like something that was created by a much larger studio. It is not without its flaws, but manages to deliver an entertaining experience nonetheless. The developers have also shown that they truly care about their product by releasing updates and addressing issues such as the camera rotation. While it is not a threat to the bigger titles in the genre, such as Divinity: Original Sin, Kyn packs enough entertainment to offer value for money. 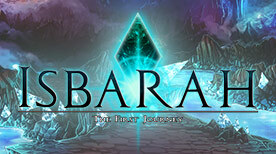 Isbarah is not a game to approach if you are looking for an easy challenge or rewards that you don’t have to work hard to earn. The game requires quick reflexes, plenty of practice and a lot of dedication to master. It is definitely rewarding though, and taking down bosses many times your own size while they are covering the screen in projectiles is quite a rush. It is not for the faint of heart, but if you are up for the challenge you simply must try out the game. Gameplay: The blend of platforming and bullet hell works brilliantly. Graphics: Beautiful 2D art with excellent character designs. Audio: Adrenaline pumping tunes.